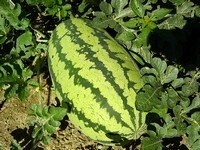 Watermelons are not particularly difficult to grow, but because they are so demanding I don't consider watermelons a good plant for beginner gardeners. (You can get lucky if you live in optimum conditions). I also don't consider them a good plant for anyone with restricted space, water, or average soils. Where and when can you grow watermelons? In the true tropics the dry season (winter) is the best watermelon growing season. Watermelons do not cope well with extreme heat or the humid, soggy conditions of our wet season/summer. Fungal diseases and bugs will wipe them out in no time. If you live in a cooler climate, then summer is the time to grow watermelons. You do need at least three months of reliably hot, sunny weather to grow and ripen a watermelon. During that time your average daily maximum temperature should be at least about 20-25°C or 70-80F. Warmer is even better. Grow watermelons in full sun. You also need an abundant supply of water and nutrients (good soil). And you need space. As I said, a rambling vine. They like to go wandering and smother everything around them. Watermelons are grown from seed. 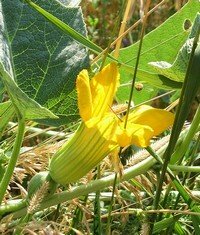 You may be tempted to use seed out of a melon you bought, but don't waste your time. It is almost guaranteed to be a hybrid. You will find a lot more interesting varieties amongst the heirlooms then you cn find in the standard collection of you local gardening centre. Start your watermelon seeds in the ground, right where they are supposed to grow. The soil should be at least 18°C for them to germinate. 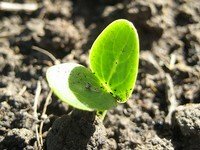 Watermelon seed germinates easily and quickly, within a few days. Watermelon plants outgrow the seedling stage very quickly, and they don't like transplanting. You don't save much time and you end up with a weaker plant. Save yourself this totally needless extra work and stick your seeds in the ground, about two cm or an inch deep. A mound or ridge is free draining (melons don't like wet feet). If you have heavy clay soil, definitely raise the bed. Mounds are also good if the soil is as poor as mine. I just make a mound of good soil with lots of compost in it to grow watermelons. Sometimes I plant them in what's left over from a compost pile after I used most of the compost. If you like growing things in neat rows, or if you want to plant a large area, grow watermelons on ridges, like the commercial growers do. 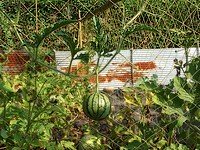 If you have a very small garden but absolutely have to have watermelons, you can try growing them on a trellis. Really. You need a very strong trellis, you need to train them up the trellis as they aren't climbers, and you need to support the developing fruit so the trellis holds the weight, not the plant. Watermelons have very shallow roots and they need lots of moisture. The soil should never dry out, and mulch helps with that. Mulch also keeps weeds down. Weeding could disturb the shallow roots, so it's better to not let them grow to start with. When the vines are about two metres long, pinch out the tips. It encourages branching. Watermelons grow male and female flowers on the same vine. The smaller male flowers appear first. The female flowers are much larger (see the photo) and you can't miss them. If you don't see any it could have several reasons: too hot, too cold, not enough water, not enough nutrients... In any way, it means the watermelon plant isn't happy. If the plant does produce female flowers but the little fruit at the base of it shrivels up and dies, then the flowers are not getting pollinated. Watermelon flowers are insect pollinated. If you suspect the insects aren't doing their job, you can do it yourself, just to be sure. To grow them as large as possible you can pinch out the tip of the branch after a couple of fruits have set (are starting to swell up). Telling when a watermelon is ripe is an art. You will get better at it with practice. Another sign is the light coloured patch on the bottom of the fruit. It is initially greenish, but as the melon ripens the green tinge diappears and it becomes yellowish. The skin overall becomes duller and tougher. The only way to get good at this is to grow and harvest lots of watermelons! A healthy watermelon in a balanced environment and in good soil should not attract too many beetles. Also, a watermelon should grow fast enough to cope with a few beetles. The other main problem with growing watermelons is mildew, a fungus that makes the leaves look as if they were coated with white powder. The fungus thrives in damp, humid conditions. The best you can do is to avoid getting the leaves wet. If you can't avoid overhead watering, do it first thing in the morning so they dry quickly. Never wet the leaves in the afternoon or evening. In the tropics you probably won't be able to control the beetles or the mildew, once the build up for the wet season starts. And it isn't worth it anyway... The oppressive heat and the humidity just aren't good conditions for growing watermelons. Grow something that likes humditiy and wait for the next dry season to grow watermelons again.